As you may well know, Advanced Compression is an option you have to pay for when using it. But as a DBA you can’t always control the use of this option, e.g. the use of Datapump with Compression parameters. 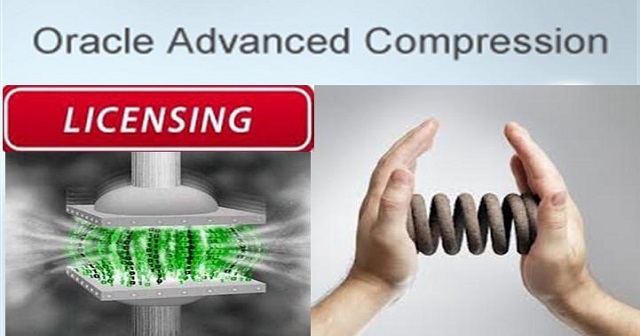 Lately, a few customers were involved in a discussion with Oracle LMS (License Management Services) about the use of Advanced Compression within their database. Using export scripts with the parameter COMPRESSION=METADATA_ONLY (which is default) does not require the Advanced Compression option. It does say that Oracle Datapump was invoked and compression used, but not WHEN compression was used. It could be used in the first 63 times of the 176 times datapump was invoked. This is important because it shows that it wasn’t used deliberately, and the script was replaced in time e.g. When the compression used is close to 176, you’ve got a harder nut to crack. If this is the only output which shows that you are using Advanced Compression, that is, no OLTP compression, RMAN, SecureFiles and Data Guard network compression, your defense is a lot stronger. The fact that this option can’t be switched off seems quite a good case for a lawyer to crack. At this moment revoking users to use Data Pump at all is the only way to avoid its usage. The fact that there’s an enhancement request to disallow unlicense compression feature with Datapump shows that there’s indeed a problem Oracle hasn’t been able to solve. There is no way to disable the use of any of the features that are part of the Advanced Compression option. is being used when it shouldn't be, you can contact the user and ask them to stop using it. So… when confronted with a license-incompliancy of Advanced Compression, purely based on the use of Datapump parameters, don’t take it for granted, but fight it. Sorry for my English, but i think it’s important to know what’s algorithm used by compression, because default behavior of expdp compression use the “NONE” Compression, that ‘s why you see a counter greater 0 on after “invoked”.